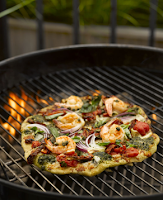 amanda mcclements & metrocurean: Any Restaurants Doing Grilled Pizza? Any Restaurants Doing Grilled Pizza? Grilled pizzas have been popping up a lot of places, my grill included. (And no, the dough does not melt through the grates.) Which got me wondering if any DC-area restaurants are tossing pies on their grills? DC's pizza renaissance has brought us plenty of delicious options — Comet, RedRocks and Pete's have joined standbys Pizzeria Paradiso, 2 Amys, Matchbox and Coppi's — but I can't think of a single one offering a grilled option. Al Forno of Providence, Rhode Island, is credited with introducing grilled pies to the US, and it caught on in New York. This spring, Chicago chef Craig Priebe released an entire cookbook on the dish. His Gamberian pie is pictured at right. Seen grilled pizza on any local menus? Pizza Zero in Bethesda makes Argentine grilled pizzas. Been there once, and I really liked it. Yep, you beat me to it - Pizza Zero is the one that sprang to mind. Also, Willow has Grilled Flatbreads which are essentially pizzas - but I'm not sure how they grill them. FYI Al Forno doesn't just claim to have "introduced grilled pies to the US" but to have actually invented them. As is with most food phenomenons, though, plenty of people claim to have "invented" them. Grilling pizzas has always intimidated me, but maybe I'll give it a try. I knew there had to be at least one out there. Thanks. Catherine - Try it! I use the dough recipe linked in the post. It's very sticky, which makes it scary. I've crumpled a few rounds onto the grill when they stuck to the cutting board I was using to slide them on. (Ate em anyway.) But once you get a feel for the dough, it's easy. Of course, you could also buy some dough from a pizza place. @don rockwell - I've worked the Flatbread station at Willow. I'm not sure what else to say about them, but they are most certainly grilled "pizzas". @catherine - Trader Joe's sells a pretty good pizza dough that has worked well for me in the past when I was too lazy to make my own. Certainly give it a try. Grilled pizza is not for the faint of heart. Make sure the grill is as hot as possible, the dough is well oiled, and the ingredients are handy.